Algae may clean polluted lakes and provide renewable fuel | O.W.N. Sandia National Laboratories is testing whether one of California’s largest and most polluted lakes can transform into one of its most productive and profitable. Southern California’s 350-square-mile Salton Sea has well-documented problems related to elevated levels of nitrogen and phosphorus from agricultural runoff. Algae thrive on these elements — a fact that causes environmental problems but could also be a solution to those problems. Sandia intends to harness algae’s penchant for prolific growth to clean up these pollutants and stop harmful algae blooms while creating a renewable, domestic source of fuel. Algae can be easily converted to fuels and chemicals using a Sandia Labs-patented fermentation process. The Department of Energy’s Bioenergy Technology Office (BETO) estimates the U.S. can produce at least 1 billion tons of feedstocks for biofuels every year, and doing so would have positive social, economic and environmental impacts. That amount equates to about 30 percent of our nation’s need for fuels that would not have to be imported. Among these feedstocks, algae are unique in that they grow exponentially: in other words, under the right conditions, doubling every day. BETO is funding Sandia’s Salton Sea Biomass Remediation, or SABRE, Project because it will help determine whether algae can be a viable part of the solution to our nation’s need for diverse energy sources. When state and local officials gathered by a tributary of the Salton Sea one bright, hot morning in late May, it was to mark the kickoff of the project’s second phase. 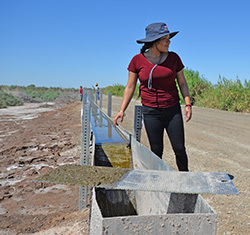 During the first phase, Sandia partnered with Texas A&M AgriLife Research to test whether a newer method of farming algae could be as productive as an older, more established method. Traditionally, companies grow single species of algae in raceways — structures vaguely resembling small race tracks or giant bathtubs. The raceways produce algae well suited for making high-value nutritional products like spirulina or beta carotene, as well as other nutraceuticals. Raceways also offer growers a lot of control. But there are a few drawbacks. They are generally high maintenance, requiring trained technicians, expensive fertilizers, carbon dioxide and high-quality water. Additionally, an estimated 30 percent of production on algae farms can be lost each year due to pest-related pond crashes. Sandia is currently doing research to minimize crashes, including testing strains of algae for resistance to various predators and diseases and learning to detect the signs of an imminent pond crash. The newer farming method is called an “Algal Turf Scrubber” floway system, used for growing a collection of native algae species. To the untrained eye, the system looks like a free-standing rain gutter. It gurgles quietly as water is pulsed in waves across a sloped floway. The algae consume the nutrients, and clean water emerges from the lower end. The system operates using solar-powered pumps, requiring almost zero maintenance, except for periodic algae harvesting which can be done using common farming equipment. Sandia designed the renewable power pump system that provides water to the floway. The technology and components of the floway were developed by a company called HydroMentia Technologies LLC. Based on early results of the testing in Texas, turf scrubbers can produce a quantity of algae comparable to raceways. And they are a perfect fit for places with acres of inexpensive real estate, nutrient-rich water (no need for additional fertilizer) and tons of sun, like the Salton Sea. The kind of turf system being tested for the SABRE Project has other benefits. It is growing algae that is native to the area, so it is naturally more resistant to attacks from local pathogens and predators. The algae’s thick texture also lends itself to easy harvesting. One of the criticisms lobbed at algae as a biofuel source is that it uses too much water. Davis disagrees with this criticism. “There’s water and then there’s water,” he said. “We’ve shown that we can grow algae in turf scrubber systems using water full of nasty components. And it still thrives.” In other words, there isn’t much that can be done with this water until the pollutants are removed. Algae blooms can grow so large that they are visible from outer space, as is the case in Lake Okeechobee, Lake Erie, the Chesapeake Bay and the Gulf of Mexico. Blooms are not directly toxic to fish, but under certain conditions, they can become harmful to marine and human life. When blooms die off, the decay process can leave waterways with “dead zones,” low-oxygen areas that cause fish to suffocate. If ingested, certain harmful algae species can also cause flu-like symptoms in people and death in pets, according to congressional testimony. Algae blooms also occur in the Salton Sea. Davis explains that the sea is the accumulation point for all agricultural runoff water from one of the largest farming areas in the United States. Nitrogen, phosphorus and other elements from fertilizers are continuously deposited into the sea. The presence of these elements feed algae blooms, with negative consequences that can cascade throughout the ecosystem. Thousands of asphyxiated, dead fish are visible on the shores of the Salton Sea each year. The smell has not done anything positive for businesses in the area, according to a study prepared by Tourism Economics for the Palm Springs Convention & Visitors Bureau. Additionally, studies suggest that the death of birds in the area may be related to strains of algae which produce toxins. “Release of untreated chemicals into open waterways has broad ecological impacts,” Davis said. Ironically, farming algae could eliminate the harmful effects of unchecked natural algae growth. Water from one of the three major tributaries of the Salton Sea flows into the 900-foot SABRE Project turf scrubber. Algae growing inside the scrubber system feed on and remove the chemicals in the water as it passes through. As the water passes from the system back into the tributary, Sandia’s team hopes the elements that kick-start algae bloom will have been removed in significant quantities. Should the SABRE Project prove successful, it could provide a model of remediation for algae blooms nationwide. There are hopes that the Imperial Valley would benefit as well. 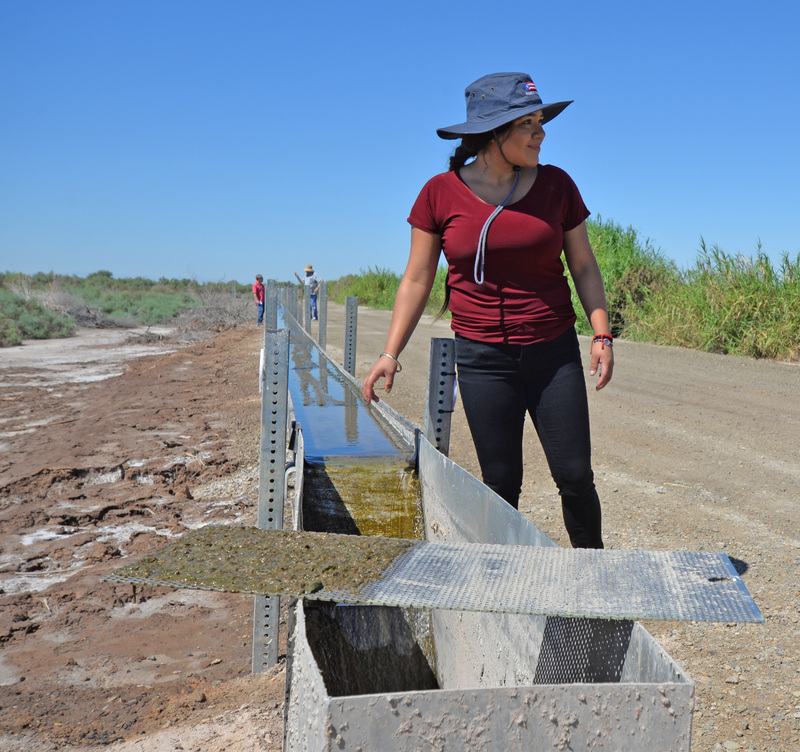 By covering thousands of acres of dry, receding Salton Sea shorelines with algae crops, turf scrubber operations could reduce widespread air pollution from toxic dust. Algae refineries could also provide new economic opportunities. Sandia National Laboratories is a multi mission laboratory operated by National Technology and Engineering Solutions of Sandia LLC, a wholly owned subsidiary of Honeywell International Inc., for the U.S. Department of Energy’s National Nuclear Security Administration. Sandia Labs has major research and development responsibilities in nuclear deterrence, global security, defense, energy technologies and economic competitiveness, with main facilities in Albuquerque, New Mexico, and Livermore, California. "The good, the bad and the algae"